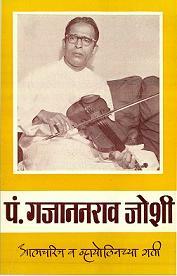 GajananbuwaJoshi.com is designed and developed by ShadjaMadhyam.com ShadjaMadhyam.com is a complete music portal for the serious listener and student of Indian Classical Music. Our attempt is to create a resource center that anybody with access to the Internet can come to, in order to learn from a Guru, listen to the performances and recordings of the Masters as well as upcoming artistes, and access other resources relating to Indian Classical Music. i-Gurukul: Leverage Distance Learning technologies and tools for teachers to impart lessons to students in any part of the world, through a Virtual Classroom. Baithak: Live and recorded concerts and performances in different parts of the world..
Sahitya: A digital repository of material useful for the serious student and researcher of Hindustani Music. Tarang: An Internet Radio, channel, devoted to Hindustani Music. Become a member of the ShadjaMadhyam community, Register as a user (it is free).